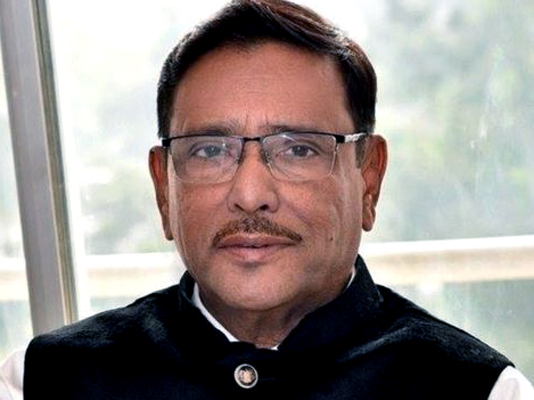 Ailing Awami League (AL) General Secretary and Road Transport and Bridges Minister Obaidul Quader, who is undergoing treatment at Mount Elizabeth Hospital in Singapore, on Saturday talked to a doctor as his endotracheal tube (artificial ventilation) has been removed, said physicians. “Quader’s endotracheal tube has been removed as his sleeping pills are also being reduced gradually,” BSMMU director Professor Abu Nasar Rizvi, who is coordinating his treatment, briefed Quader’s family and others at Mount Elizabeth Hospital lobby on Saturday, adding “After removing the tube, he (Quader) talked to me”. Quader’s wife Isratunnesa Quader, his younger brother and Basurhat Pourashava Mayor Abdul Quader Mirza, Shafiqul Islam Shimul, MP, and other members of Quader’s family were present, according to a press release of road transport and bridges ministry. On Wednesday, cardiothoracic surgeon Dr Sivathasan Cumaraswamy, senior member of the medical board, conducted the Awami League general secretary’s.